Over on his hackaday.io blog, Gonçalo Nespral has written about his experiences in recreating Samy Kamkars now famous low cost rolljam attack. 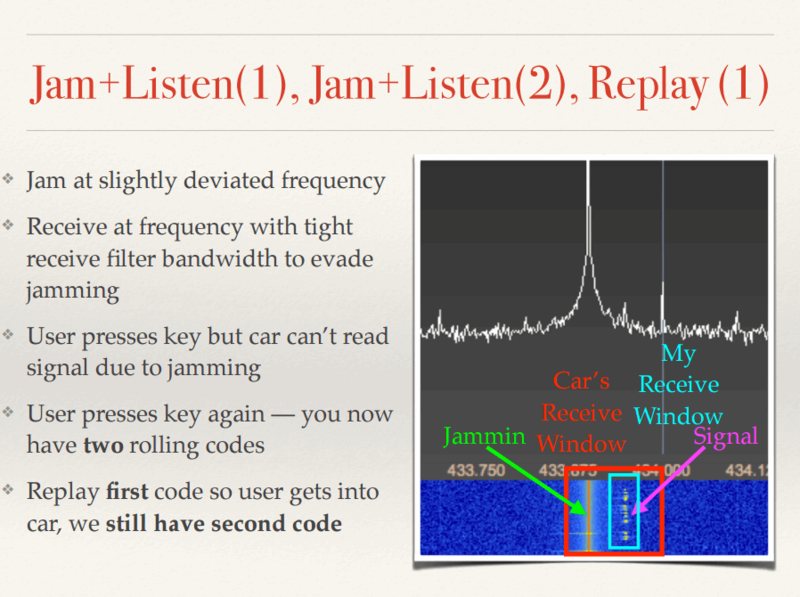 A rolljam attack allows an attacker break into a car by defeating the rolling code security offered by wireless keyfobs. Back at Defcon 2015, an information security conference, Samy Kamkar presented a method for creating a $32 Rolljam device that consisted of two 433 MHz transceiver modules controlled by an Arduino. In his version, Gonçalo was able to recreate the attack using a Yardstick One and an RTL-SDR. The RTL-SDR receives the signal, whilst the Yardstick One performs the jamming and retransmit functions. Actually using this attack in a real scenario would be difficult due to the need to properly jam and receive the keyfob signal, which could prove tricky in an uncontrolled environment. However, there have been reports of criminals entering high end cars with wireless devices before and this could be one such attack method in use. The important thing to learn is to be suspicious if your car key fob doesn't work on the first press while you are definitely in range of the car. To mitigate the possibility of wireless keyfob attacks, always use a manual key and if you must use the wireless keyfob, only unlock the car when standing right next to it, so that the keyfob signal is strong enough to overcome the jammer. Although it is still plausible that an attacker could attach the rolljam device to the car itself for greater jamming power, and then retrieve it later.